Graev and I have been pretty excited about Titanfall ever since we played the beta. We both consider ourselves to be ‘average’ when it comes to first-person shooters. We’re never going to top the K/D ratio charts or consistently lead a team to victory, but we enjoy the action and get-in-get-out fun from your everyday gamer perspective. Your options are vast in today’s marketplace. Call of Duty and Battlefield dominate the FPS space with consistency. Is Titanfall a contender? Should you spend your money and give it a ‘shot’? Read on for our complete thoughts on Titanfall and a chance to win some free stuff! Gameplay in Titanfall is uniquely intense without ever subjecting the player to a lapse in action like one might find in Battlefield. The 15 available maps are on the smaller side, but with only 6 players per side and a squadron of AI controlled grunts it somehow manages to feel ‘just right’. Leaping through windows, jumping rooftop to rooftop, wall-hanging, jet packing around, sprinting, cloaking, hanging off enemy and friendly titans, and leaping into the waiting arms of your titan — an experience you simply have to experience at least once in your life — are all enough to make any match satisfying. The opportunities to use the map to your advantage while doing all of the above are incredible and easily a distinguishing factor between the novice and experienced players. Read on for a chance to win! Titanfall’s storytelling is minimal. Campaign mode offers a set of loosely linked matches with a very subtle and easily-missed overarching narrative. You may be asking yourself, “Why should I play Titanfall’s campaign mode?” You will unlock a set of Titans to use in the other modes. It’s really that simple. You will have to play enough to finish up both sides of the campaign, but it goes quick. To be quite honest, you probably won’t even realize you’re playing a campaign. Titans feel heavy in all the right ways as they lumber around the map, yet limber enough to provide that feeling of being inside and controlling their movements. Titans feel perfectly vulnerable to both infantry hiding among the terrain and other titans capable of delivering a crippling titan punch. Placing your titan into defense and follow mode takes this ‘vehicle’ and turns it into a deadly companion. I love to place mine right at one entrance to a building while I camp the other side. Easy points while guarding an objective! The leveling system provides a nice stream of goodies. Using weapons to complete challenges will grant you both experience and the unlocks you need to customize your arsenal. Burn Cards allow players to gain boosts upon death. To oversimplify the mechanic, they are death streaks. You get one-time use cards you can slot to give you a boost when you die. Simply activate the card and you will get a boost like run speed, experience, reduced time to spawn a titan, more damage, etc. Titanfall lacks the volume of unlocks like you’ll find in other shooters, but that is made up for by making each weapon feel unique. You won’t find two weapons that play alike. The AI component of Titanfall is a shortcoming. Grunts are akin to the creeps you’ll find in MOBAs like League of Legends and DOTA 2. They’ll help you complete challenges and give experience, but their best feature is confusing newer players into thinking they just mowed down a group of players; that’s when you come in from behind for a well-timed jump kick. They are a necessary evil, though. When the maps are this small and only 6v6 you need that sense of a big huge battle going on all around you. I really can’t say enough good things about Titanfall’s ability to blend all of this gameplay together. Seriously. Leaping off a building at your titan to have it grab you and thrust you into its chest, then to turn and smash your titan’s fist into the chest of an enemy titan to expose the enemy player… it gives me nerd chills every time. Despite its lack of weapons and often worthless AI, Titanfall has incredible polish and a harmonious balance of features you won’t find in any other game. Titanfall simply feels NEW. That’s not something we can normally say about any first-person shooter. We give Titanfall a solid 9/10. 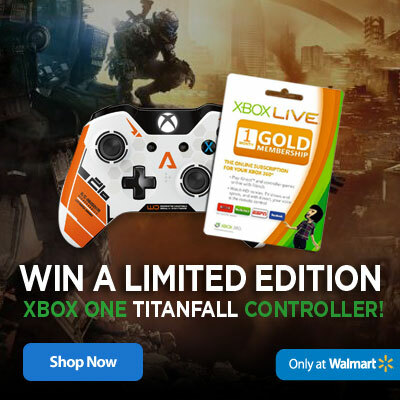 Want a chance to win cool Titanfall stuff? 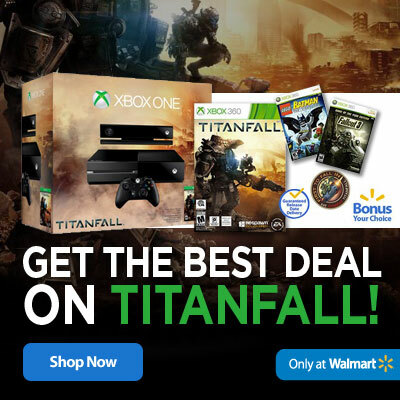 Titanfall is now available on Xbox One and PC. If you’re getting the console version be sure to check out the exclusive game and console bundles available at Walmart. If you haven’t jumped on the next-gen console bandwagon yet, the Xbox 360 version comes out 3/25. Walmart’s bundle will has an exclusive First to Fall Tactical Patch and comes with Your Choice Platinum Hit Game. This giveaway is sponsored solely by Lunchbox. While we have been compensated for this giveaway, the opinions expressed here remain solely our own. Well, as I’ve not bought the game I’m very keen to win it – normally I’d have bought the bugger but I got made redundant so money is just too tight. I know the Grunts are just cannon fodder but thought the Spectres would be more competative and wonder what’s happened to the top tier “Marvins” ? You can still round a corner, stare at one for 3 seconds, then blow it away. Spectres are a little bit annoying if they swarm your Titan. I think I had 2 of them poppin’ off rockets at me in a match yesterday. What is your opinion on the 49gig install, Keen? I was blown away by how large it is. I read that they did that to put in uncompressed audio so that the game will be more compatible with lots of different systems. The game runs beautifully. I’ll give them that. If that’s what it takes… maybe i can excuse it. Meanwhile my SSD is crying. That is indeed the reason they gave. What they also did was put in all the uncompressed files for every possible language, not only the one you selected, which is less…. Ah, that I did not know. As a consumer of Titanfall for the Xbox One. The game is one of the best shooters made in 2014 and it runs great. Leveling and customizing in the game will keep us gamers busy for quite awhile. I like the bots in the game to help us complete challenges. I would Give this game an 8/10.. I really did enjoy the beta, but it also just me interested in MechWarrior Online again! Something about big ole’ robots! I’m currently waiting to see how it looks on the 360. Then I need to decide if I want to play at my desk (PC), on my sofa with friends (360), or on my sofa alone (X1). Hmmmm. Thx for the info gents!